There are few celebrities that can measure up to Audrey Hepburn on multiple levels. She has remained and will continue to be not only a revered movie star but as an enduring and continuously recognized fashion icon. What is so incredible is that Hepburn’s style and unmatched reputation is that they have neither waivered nor been tarnished in any way for over half of a century. David Wills flawlessly and seamlessly traces the trajectory of Audrey Hepburn’s meteoric and iconic style status from the very start of her career. The text is extremely easy reading and includes so many quotes from those who had the good fortune to have worked with her as well as the select few who provided her screen wardrobe as well those she favored for her private life. The book is lushly and chronologically documented through her films and early years via countless photographs of that era. What is quite clear is that Hepburn was quite self-aware and played a huge part in creating both her on screen and private life personae. One might say she was definitely the captain of her ship. She understood the power of her craft as well as the obstacles she faced from the very start. Audrey Hepburn began her career during the Marilyn Monroe and Diana Dors era of celebrity, which simply means that she shared none of the physical qualities of those two blondes and many more blonde bombshells of her era. 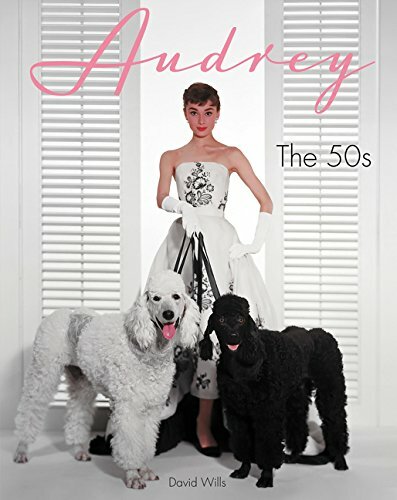 Audrey: The 50s leaves off before she becomes she is eternally remembered as Holly Golightly. As if all these accolades were not enough, there is also the fact that she was universally respected for her choices, her ethics, and her charity. If you are a fan of Audrey Hepburn, the book is a must. If you want to read about the evolution of a style and a fashion icon, then the book is a must. If you are the kind of reader who devours Hollywood legends who leave a mark, then this book is a must.